In 2019, the U.S. economy will likely move into a late cycle phase offering the FOMC less clarity whether to increase rates or end rate increases altogether. Less economic clarity led the FOMC to shift to a data driven strategy when determining their rate decisions. With that, both the FOMC and investors now occupy a relatively equal decision plane when making their rate judgements. As a result, greater financial market volatility could result when investors, using the same data, reach markedly different conclusions. With the Fed funds rate approaching, the not easily determined, neutral rate estimated to be a range of 2.5-3.5%, the FOMC faces its most difficult rate decision—when to end rate increases. 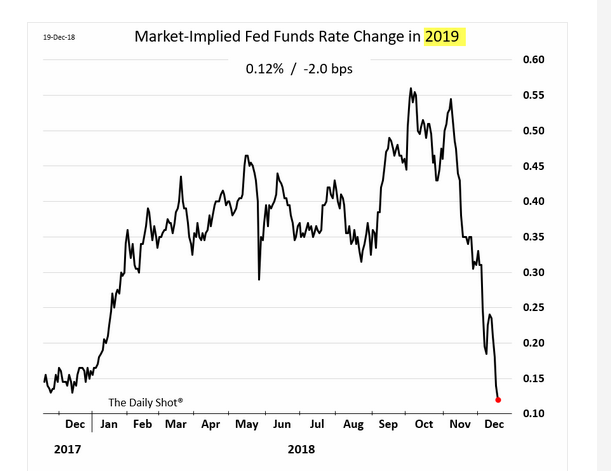 The Fed funds futures markets suggest the December meeting represented the last increase – one and done – with a low probability of even one increase in 2019 (see figure 1.) 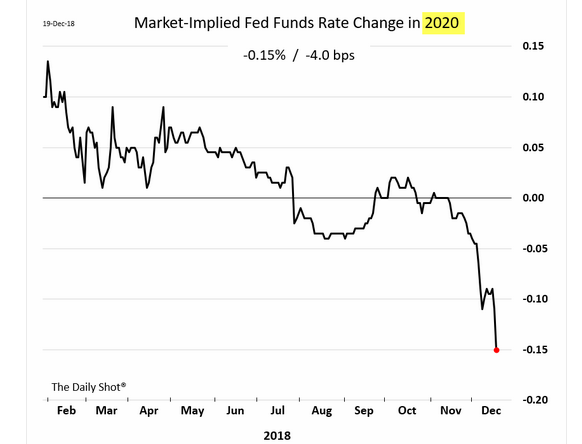 Looking into 2020, the Fed funds futures market curve calls for a lower Fed funds rate (see figure 2.) In comparison to the Fed futures markets, the FOMC currently looks for two increases in 2019 and one in 2020. To determine further rate changes, the FOMC will employ its newly adopted data dependent policy. 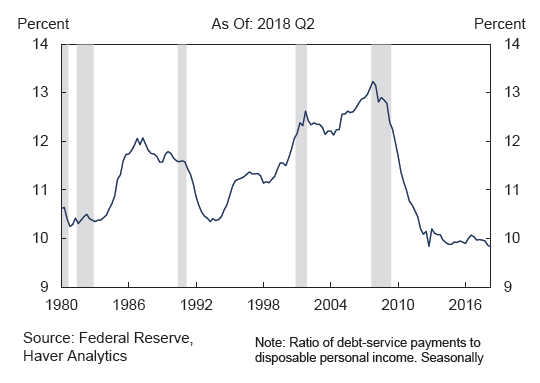 Interestingly, the data the FOMC will depend on in the first quarter may not be dependable based on fourth quarter aberrations and the resulting first quarter distortions. 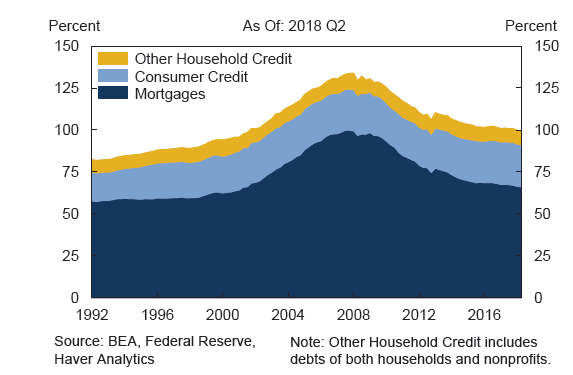 For example, fourth quarter 2018 inventory buildup to beat the now delayed tariff increases will likely borrow and therefore negatively effect, at the margin, first quarter economic data. Specifically, the National Retail Federation’s Global Port Tracking Report showed that a new record of 2 million containers (measured in Teu’s) entered the United States in October. This represented a 9% increase when compared to September and over 13% Y-O-Y. The October number represented the highest volume for any single month since the survey begin in 2000. A similar increase should occur in November. With fourth quarter front loading of imports, January import container volumes will likely decline from a year ago by an estimated 2% and that downward trend will likely continue through most of the first quarter. Trucking accounts for 70% of all modes of domestic freight transportation. The same distortions show up in truck freight as in container shipments. Once containers leave the port, at some point trucks will deliver them to their final destination. In October, the last reported month, the American Truck Association’s ATA Truck Tonnage Index increased 6.3% compared to September (see figure 3.) Strong import shipments, particularly on the west coast, helped to create the October surge. When compared to October 2017, tonnage increased 9.5%. Truck tonnage, similar to containers, will likely show a slowdown in the first quarter of 2019. Chair Powell increased the frequency of his “press” conferences to monthly from quarterly. In our view, with the absence of FOMC future guidance, those conferences could produce increased volatility if his comments do not meet investor’s expectations – good or bad. The chair’s December “press “conference did not fully deliver what investors wanted to hear—as many see the fed’s key role as meeting investor expectations. The markets reacted with a sharp decline. Besides investors, the FOMC, in its December decision to raise rates, also demonstrated the fed’s independence from the President. In effect, the Chair and the FOMC indirectly reminded all that its dual mandates comprise maximizing employment and stabilizing prices–not strictly satisfying investors (see our 11/9/2018 commentary “The Fed Put May Be Kaput“.) The December FOMC rate increase also caused the president to increase his war against Powell. His continuing Tweet storm destabilized equity markets – surprising since the President sees the stock market performance as a measure of his success. Our prior commentaries looked for a slowdown in 2019. At the same time, we expressed less certainty as to its timing in that year. On balance, we continue to recommend an equally weighted portfolio asset mix of equities, alternative investments, and short duration fixed income securities. We respect the concerns showed by the major equity markets for potential economic slowing in 2019 and a possible downturn in 2020. At the same time, such sharp equity market downturns can create investment opportunities for those investors with liquidity and both the risk tolerance and strong stomach to look over such periods. For long-term investors – one to five years – the following table should provide some time perspective for that opportunity (see figure 6.) The table shows the positive performance of the S&P 500 following sharp quarterly declines similar to the fourth quarter. When excluding the depression years, all other periods show positive performance for one, three, and five years. Wishing all a happy, healthy—most important, peaceful—if only, and a prosperous new year.